Kathleen Bell was chosen as a 2018 Chamber Person of the Year for her service to many volunteer organizations in Mascoutah. 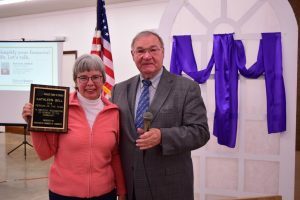 Of special note is her dedication and service to the Mascoutah Historical Society and Mascoutah Heritage Museum. The Chamber thanks Kathleen for her service. The Award is given for volunteer service and not be part of any job or occupation. The award was presented by 2016 winner Jerry Daugherty.